Please note that the content of this book primarily consists of articles available from Wikipedia or other free sources online. 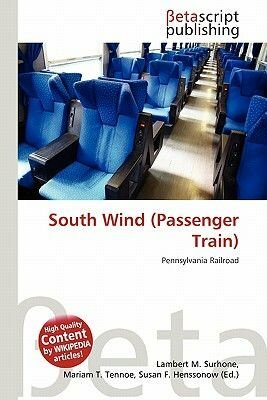 The South Wind was a named passenger train equipped and operated jointly by the Pennsylvania Railroad, the Louisville and Nashville Railroad, the Atlantic Coast Line Railroad (later Seaboard Coast Line), and the Florida East Coast Railway. The South Wind began operations in December 1940, providing streamliner service between Chicago, Illinois and Miami, Florida. This was one of three seven-car streamlined trains operating every third day along different routes between Chicago and Miami. The other two trains were the City of Miami and the Dixie Flagler. The South Wind remained in service through the creation of Amtrak in 1971 but was soon replaced by the Floridian.